Operatives, reload your guns. 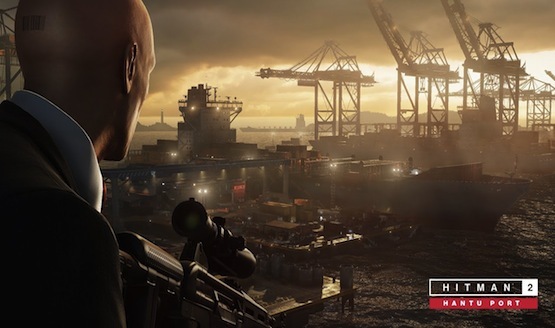 The Hantu Port Hitman 2 Sniper Assassin map will come out on March 26, 2019. This time, Agent 47 will fly off to Singapore to save Han Ldong and his wife. The couple have been kidnapped by the Heavenly Guard, a group of highly trained criminals. The affair takes place in a port, as the Heavenly Guard is trying to transfer their hostages to a cargo ship. For the first time in Hitman series history, Hitman 2 allows you to play these Sniper Assassin missions with a friend, thanks to a co-op option with agents Stone and Knight. While playing co-op, you can still complete challenges, upgrade your weapons, and earn multipliers to get the best score possible. You just have a helping hand. If you already own the $39.99 Expansion Pass or Expansion Pack 1, you will be able to play this mission when it launches. As a reminder, the pass also includes new missions, locations, sniper maps, challenges, weapons, and outfits from Expansion Pack 1 and 2. For those who are interested in the game but don’t want to splash the cash, Warner Bros recently released a free starter pack for Hitman 2. It offers the Hawke’s Bay location, which set in New Zealand. In addition, you can carry over your save progress to the full game, should you you decide to take on Agent 47’s latest adventure. Warner Bros and IO Interactive have actively been updating the game, as last month, the developer improved the AI with a new patch. Now, NPC’s don’t run towards where you make the shot, despite not knowing where the shooter is. Instead, they search the area where the bullet was fired, making Hitman 2 more realistic. The team also added a few visual improvements, such as the addition of HDR, lighting enhancements to Legacy locations, better sky colors, and a higher contrast. The inventory loadout UI was improved to make preparations more organized and less cluttered too.